Denuvo Anti-Tamper DRM was removed on March 11, 2019. Modifies the NPC face LOD system and increases draw distances, also includes its own DoF removal patch. As of Patch 2 the NPC LOD is fixed, other fixes can still be used. Does not work with Patch 3+. No noticeable pop-in of objects. Download LodMod and extract their contents somewhere convenient. Read patches.txt and decide which patches you want to apply. Click Load CD-Image File (floppy drive to the right of ISO File). Set Files of type to All Files. Browse to <path-to-game>\media\ and select Yakuza0.exe. Click Load PPF-File (floppy drive to the right of Patch) and select a patch file. Click Apply PPF-File to apply the patch to the executable of the game. Repeat step 4 onward for each patch you want to add. Can significantly impact performance depending on the patches you choose. To uninstall, verify integrity of game files through the Steam client. Normally the audio system may use up to 12% of CPU time, "performance mode" can reduce this to lower than 1%. May stop the game from detecting audio devices being added/removed, requiring the game to restart to make use of them. May no longer be required as of Patch 2. Capped at 240 FPS. Changeable in graphics.ini. 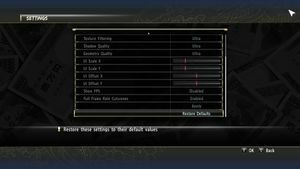 Install Yakuza 0 3D Vision Fix. Press 2 while in-game for bloom multiplier presets going from x0 to x1. The game applies a blur effect while in first person view that some might find unwanted. Install the Special K mini-plugin for the game. While running the game, press Ctrl+⇧ Shift+← Backspace to bring up the Special K control panel. Expand the Yakuza 0 section. Follow the steps in the LodMod section above, making sure to install the "firstperson-fix.ppf" patch file. The game includes a low-quality depth of field pass that some might find unwanted. Follow the steps in the LodMod section above, making sure to install the "dofremoval.ppf" patch file. Press F5 while in-game to disable. Allows low-end users to disable ambient occlusion for a significant performance gain. Press F6 while in-game to disable. Press F4 while in-game to disable. Replaces the textures ingame with the higher quality textures from cutscenes for major characters. Download High resolution characters textures mod. Unpack the files to the installation folder and overwrite if prompted. Cross, Circle and Square prompts are incorrectly mapped for the V2 controller. Can be fixed by enabling PlayStation Configuration Support in Steam. V1 and Wireless Adapter untested. Dualshock 4, Xbox 360, and Xbox One presets are present. Steam Controller defaults to the Dualshock 4 preset. Change these volume options to your liking. 1.000 is equal to 100%; 0.500 is equal to 50%, etc. The game increases the global audio level of the operating system in some cases (75% for the Sega logo at the start, 100% when using an arcade machine). Enable Lock Volume and/or Quiet Start Mode and tweak them as desired. Download No cursor icon mod. Replaces in game cursor icon with fully transparent texture. 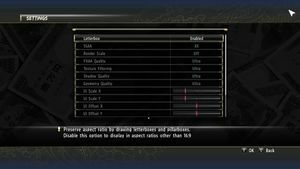 Aimed for players who use game pad exclusively for this game, to avoid cursor appearing in cutscenes and in screenshots. Doesn't remove system cursor in borderless mode. Not recommended for keyboard and mouse players. The PC version have missing or broken lighting and/or shadow effects in some cutscenes. See this thread for more information. Patch 3 fixes this (currently in beta). 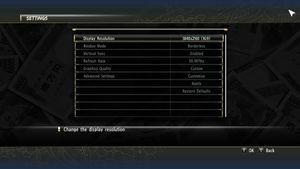 Tools for modding the PC version of Yakuza 0. Press F3 while in-game to disable. Restores two songs (Bubble and Kurenai) from the band Shōnan no Kaze that were replaced in the English version. One track is used in the intro cutscene and opening credits, the other in the ending credits. 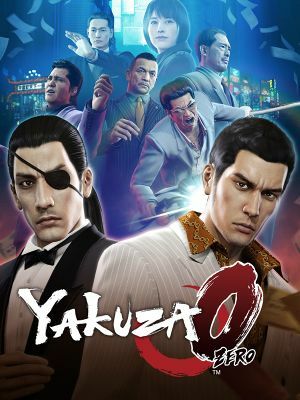 Download Yakuza 0 Music Restoration Patch. ↑ 1.0 1.1 File/folder structure within this directory reflects the path(s) listed for Windows and/or Steam game data (use Wine regedit to access Windows registry paths). Games with Steam Cloud support may store data in ~/.steam/steam/userdata/<user-id>/638970/ in addition to or instead of this directory. The app ID (638970) may differ in some cases. Treat backslashes as forward slashes. See the glossary page for details. "the Sega logo sets it to 75% and then back to whatever it was set to before"
"I noticed that when you start the arcade machines it sets the volume to 100%, and if you change the volume while on the machine and then leave, it sets it back to 100%."